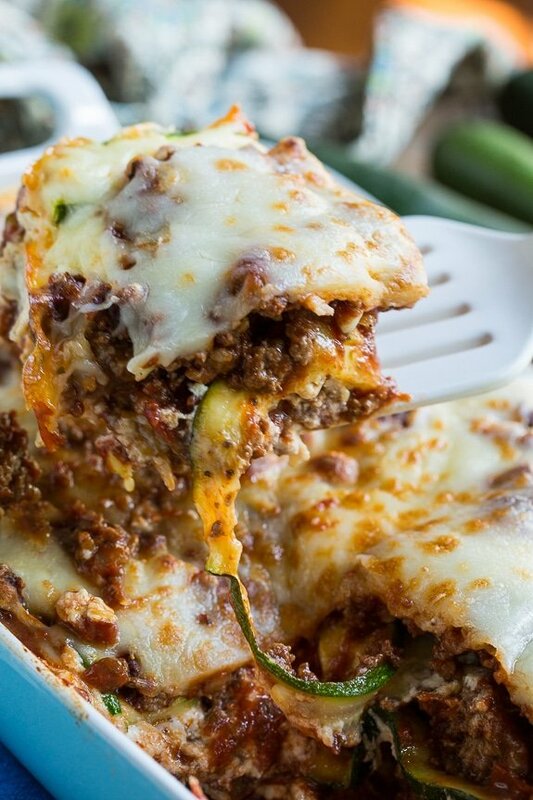 Zucchini Lasagna has a thick meat sauce made with ground beef and Italian sausage, ricotta and mozzarella cheeses, and thinly sliced zucchini in place of noodles. 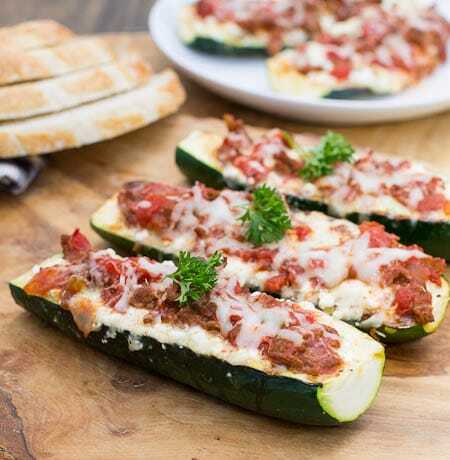 It’s low carb and gluten free and a great way to use up summer zucchini. I actually like this lasagna better than traditional lasagna with noodles. It’s so much healthier and quite frankly, zucchini adds much more flavor than pasta noodles. Zucchini is very full of water and if you don’t take a few precautions, you will end up with watery, liquidy lasagna. Yuck! There are a few things that can help prevent this. Lightly sprinkle the zucchini slices with salt and let them sit for 10 minutes or so. You will begin to see beads of water form on the outside. Dab them off with paper towels. Briefly grilling the zucchini also helps remove moisture, plus I think it makes the zucchini taste better. I just use my grill pan for this and it only takes a few minutes. Finally, use a super, super thick sauce. The liquid that the zucchini does release will make it just the right consistency. 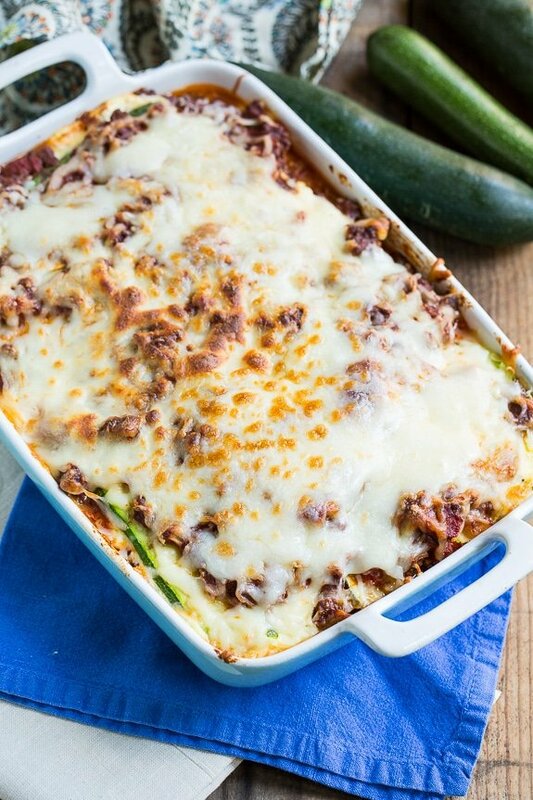 Thirty minutes in the oven and get ready to enjoy a fabulous lasagna full of ground beef, Italian sausage, and zucchini. You could sub chopped vegetables for the meat and make this lasagna vegetarian. In a large pan, brown ground beef and Italian sausage, crumbling it with a wooden spoon. Once most of pink is gone, add onion. Continue to cook for 2 to 3 minutes to soften the onion some. Add garlic and cook 1 more minute. Drain off any excess liquid/fat. Add diced tomatoes and tomato paste. Stir well to combine. Mix in Italian seasoning, salt, and red pepper flakes. Sprinkle zucchini lightly with salt and let sit for 10 minutes. This will draw some of the moisture out of the zucchini and help prevent the lasagna from being runny and liquidy. 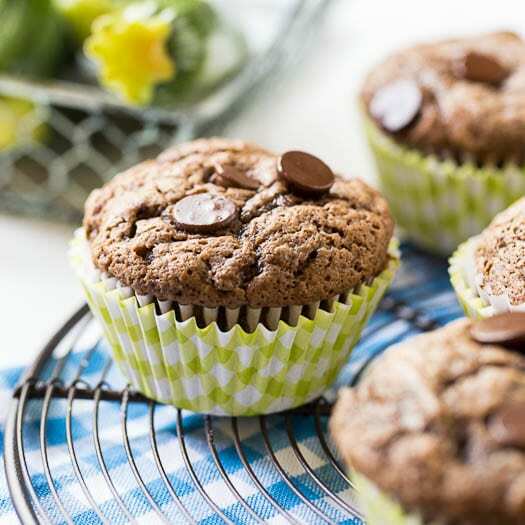 Blot zucchini with paper towels. Heat a grill pan or large skillet over medium-high heat and coat it with olive oil. Cook zucchini for just a minute or 2 per side to soften. No need to completely soften the zucchini, you just want to get the cooking process started. Preheat oven to 350 degrees and coat a 9X13-inch pan with cooking spray. 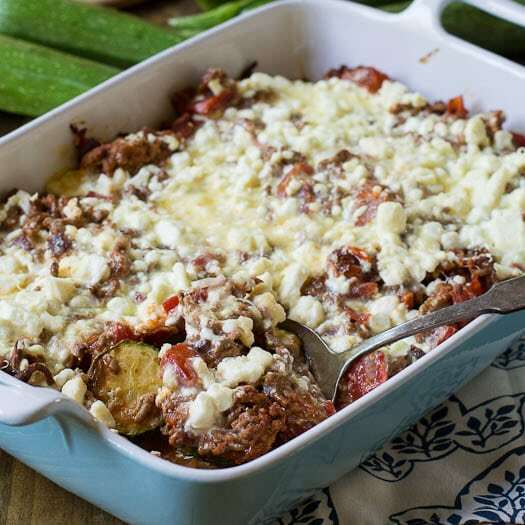 In a bowl, mix together ricotta cheese, egg, 1/2 cup mozzarella, and Parmesan cheese. Place 1/3 of zucchini slices on bottom of casserole dish as you would lasagna noodles. Top zucchini with 1/3 of meat mixture and 1/2 of cheese mixture. Do another layer of zucchini, sauce, and cheese. Place the third and final layer of zucchini and top with remaining sauce. Cover with the remaining 1 1/2 cups shredded mozzarella cheese. Place baking pan on a baking sheet and place in oven for 30 minutes. Let cool for 15 minutes before slicing. This entry was posted in Dinner, Main Dishes and tagged Lasagna, zucchini. Bookmark the permalink. So cheesy and good! The whole family enjoyed it! This was terrific! I made it using tomato sauce that I already had made, and also my own homemade pesto sauce: this helped this dish go together really fast. My husband grilled the zucchini outside, and it was just 30 minutes after that, we were eating. This is most definitely our only lasagna recipe, from now on! So glad you enjoyed it Michele! Oh this was amazing! Best cheat meal ever and the kids loved it. Glad you liked it and especially glad the kids did! Know it can be hard to get them the eat veggies! This is one of my favorite summer dishes! Such beautiful photos! I LOVE all your tips on a non-watery zucchini lasagna! I tried a recipe similar to this a few years back and it was waaay too watery. Now I think you just convinced me to give it another try! Love that you grill the zucchini first! Ok this lasagna is perfection in every possible way! This lasagna is so great! It has more veggies and I like that. 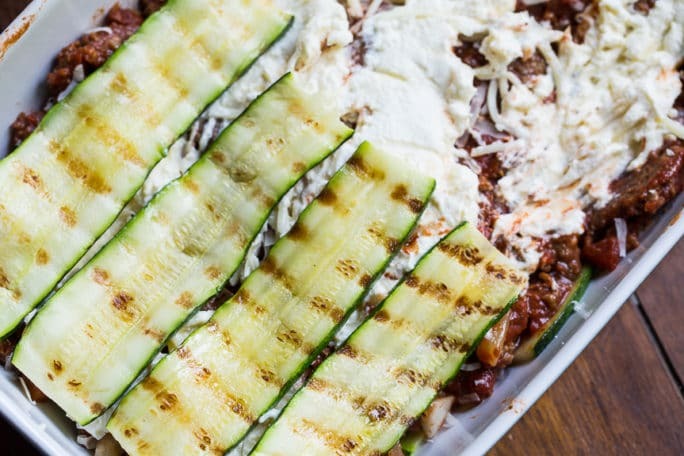 I love zucchini lasagna and yours looks absolutely perfect, Christin! I can always get behind sneaking in more veggies in comfort food. Grilling the zucchini beforehand is such a great idea too and I can’t wait to try that! 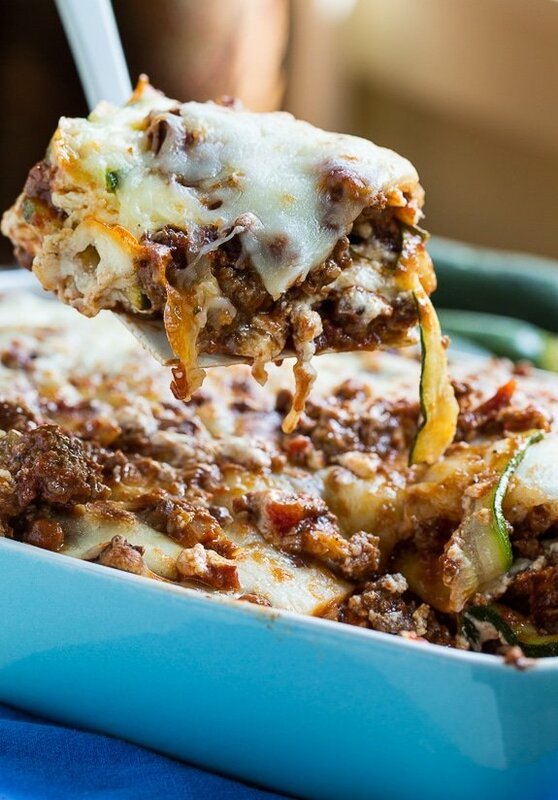 I love lasagna and zucchini, so this is perfect! Love that you combined the two, this is total comfort food. This zucchini lasagna looks every bit as satisfying and comforting as regular! I definitely wouldn’t miss the pasta! I love this idea, I need to go buy a zucchini ASAP! 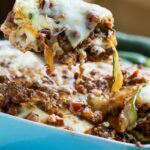 Christin – I so love your version with that chunky sauce and the combo of sausage and ground beef with zucchini “noodles”! This lasagna looks fantastic, Christin! I’ve never had zucchini lasagna, so you are definitely making me change that. Love how full of flavor this is! Pinned!